TWO key players in Donald Trump's presidential campaign have been charged with "conspiracy against the United States" and a third Trump campaign operative has admitted to lying to the FBI, as the probe into Russian meddling in the US election claims its first scalps. 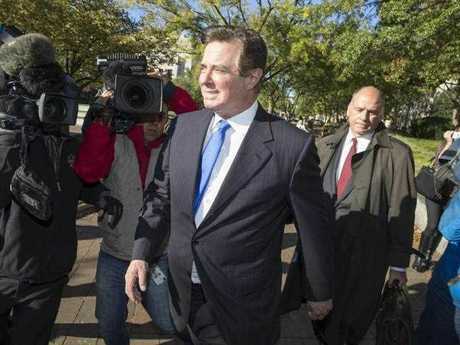 Mr Trump's former campaign chairman Paul Manafort and business associate Rick Gates will face 12 charges that include conspiracy against the US, conspiracy to launder money, acting as an "unregistered agent" of the Ukrainian government, making false and misleading statements to investigators, and failing to disclose foreign bank accounts. Both men pleaded not guilty in court on Monday afternoon and were placed under house arrest. Investigators allege the two men were part of a secret "scheme" where they acted as foreign agents for a pro-Russian Ukrainian party, that they hid the $75 million they were paid and that they lied to authorities about it. Meanwhile, Trump campaign foreign policy adviser George Papadopoulos has pleaded guilty to making false statements to the FBI about his relationships with Russian operatives, a crime that carries a maximum sentence of five years' jail and a $250,000 fine. According to a court document, Mr Papadopoulos "lied to special agents of the Federal Bureau of Investigation … about the timing, extent and nature of his relationships and interactions with certain foreign nationals whom he understood to have close connections with senior Russian government officials". Mr Papadopoulos made repeated efforts to set up a meeting overseas between Mr Trump and the Russians, but another campaign official stepped in to make sure that any meetings did not include the future president. be someone low level in the campaign so as not to send any signal," an unnamed campaign official wrote in an email, according to court documents. In response to the alleged conspiracy involving Mr Manafort, the President tweeted that the conduct happened before he was running his campaign. The President then tried to turn attention towards Hillary Clinton and reports that her campaign helped to pay for the notorious dossier that alleged Mr Trump had close ties to Russia. 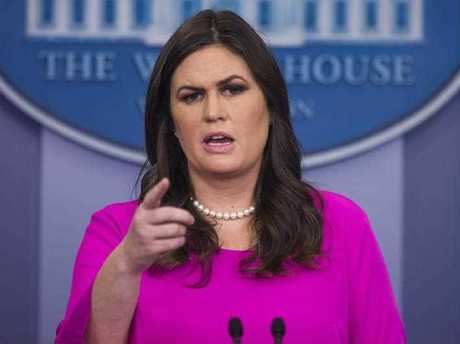 White House spokeswoman Sarah Huckabee Sanders said the revelations had "nothing to do with the President and nothing to do with the campaign or campaign activity" and reiterated that there was "no evidence of collusion" between the Trump campaign and the Russians. "Most [of the alleged crimes] took place well before the campaign even existed," she told reporters in Washington on Monday afternoon. She said Mr Papadopoulos had an "extremely limited", volunteer role with the campaign and none of his actions were conducted in an "official capacity". His "outreach" was repeatedly "pushed back". "This has nothing to do with the activities of the campaign, it has to do with his failure to tell the truth," she said. Ms Huckabee Sanders argued that the Clinton campaign and the Democratic National Committee helping to fund a dossier on Mr Trump was a much bigger scandal. "That was millions of dollars being sent for … false information. 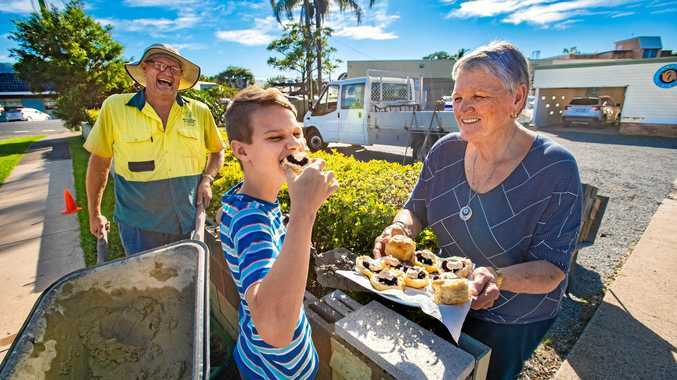 That's a big deal and big difference," she said. Mr Manafort and Mr Gates both turned themselves into the Federal Bureau of Investigation in Washington on Monday morning, a day after reports emerged that the special counsel probe led by Robert Mueller was about to lay charges. The development will be a major headache for the President, who has attempted to dismiss the investigation as a "witch hunt" and a "hoax". 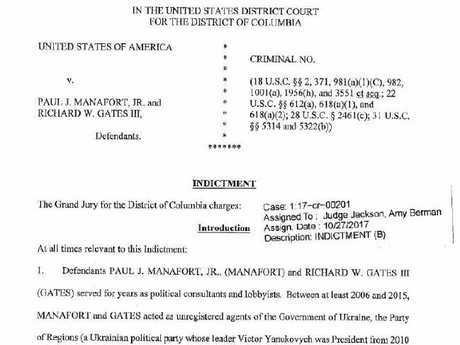 According to the indictment, both Mr Manafort and Mr Gates "acted as unregistered agents of the government of Ukraine" and the Russia-aligned former president of Ukraine, Viktor Yanukovych, between "at least 2006 and 2015". The Justice Department asked the men about their activities but they replied with a "series of false and misleading statements". "Manafort and Gates generated tens of millions of dollars in income as a result of their Ukraine work," the indictment reads. This means the alleged conspiracy was going while Trump's presidential campaign was in full flight. The indictment said the men deliberately concealed their work as foreign "agents" and funnelled $75 million through various foreign banks accounts to hide their "scheme". Mr Manafort is accused of laundering more than $18 million. Mr Manafort also allegedly avoided paying tax on the income, which he used to "enjoy a lavish lifestyle in the United States", buy "luxury goods and services" for him and his family, and buy multimillion-dollar properties. Mr Gates, meanwhile, used the offshore funds to pay for his mortgage, children's tuition and interior decorating in his Virginia home. The Justice Department probe is looking into whether the campaign colluded with the Kremlin to sway last year's election in Mr Trump's favour. The indictment against Paul Manafort and Rick Gates. While the indictment alleges that the men worked as agents for a pro-Russia party in Ukraine, it does not provide evidence that Russia colluded with the Trump campaign. Furthermore, Mr Trump and the campaign are not mentioned in the 31-page document. However, the Trump campaign is mentioned repeatedly in court documents relating to Mr Papadopoulos, who has admitted to making false statements and significant omissions during an interview with the FBI on January 27, a week after Mr Trump's inauguration. The documents show that Mr Papadopoulos met with an unnamed foreign professor with "substantial connections" to Russian government officials while Mr Papadopoulos was part of the Trump campaign. The professor only became interested in working with Mr Papadopoulos after he learnt he was a part of Mr Trump's campaign. The professor told Mr Papadopoulos that he had "dirt" on Mrs Clinton in the form of "thousands of emails". Mr Papadopoulos admits he lied to the FBI about when the meeting occurred, initially telling them it happened before he was a part of the campaign. The Trump staffer told agents the professor was a "nothing", but investigators later discovered that he had described him as a "good friend" in an email to several members of the Trump campaign. Mr Papadopoulos "sought to use the professor's Russian connections in an effort to arrange a meeting between the campaign and Russian government officials" and thought intelligence from the professor could "increase his importance as a policy adviser to the campaign". Mr Papadopoulos also downplayed his relationship with a "female Russian national" who was introduced to him the niece of Russian President Vladimir Putin. The woman turned out not to be related to Mr Putin. He claimed he met her before he joined the campaign, but in fact he met her afterwards. "He sought to use her Russian connections over a period of months in an effort to arrange a meeting between the campaign and Russian government officials," the court documents read. Despite repeated attempts to set up a meeting, one never occurred. Trump wants Russians to Hack Hillary: Donald Trump asks Russian hackers to find missing 30,000 emails. After his January 27 interview, Mr Papadopoulos deleted his 12-year-old Facebook account, which contained information about his communications with Russian advocates, and changed his mobile phone number. Mr Manafort was fired as the head of Mr Trump's campaign last year after reports emerged that he had received $12 million in undisclosed payments from Mr Yanukovych. The FBI raided the former Trump operative's home earlier this year as part of investigations into money laundering, tax violations and whether he had not properly disclosed his foreign lobbying. 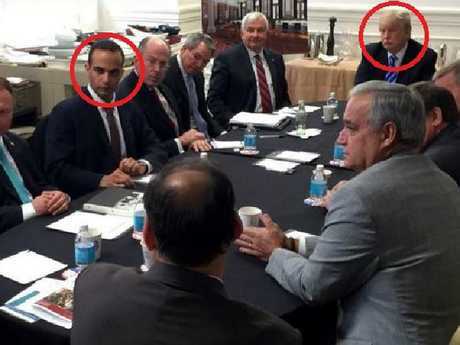 Donald Trump tweeted a picture in March of 2016 that shows George Papadopoulos in a national security meeting with him.